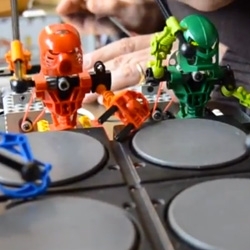 VIDEOToa Mata Band by Giuseppe Acito is an electronic band of toys-robot that play some tiny music instruments drived by Arduino Uno and Clavia Nordbeat, a MIDI sequencer app for iPad. 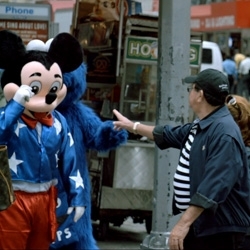 VIDEOSTREET is an unscripted 61-minute high definition video filmed by artist James Nares over one week in New York. The slow motion footage shows the city's streets filled with people and incredible detail. 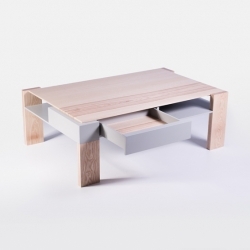 'MOD' Table by the French designer Amaury Poudray and the cabinetmaker Jerhome, exihbited at the Biennale Internationale Design Saint-Étienne 2013. 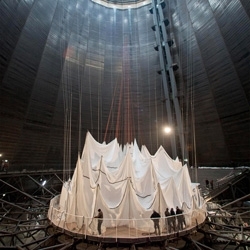 Big Air Package, an indoor installation for the Gasometer Oberhausen in Germany is 90 meters high, with a diameter of 50 meters and a volume of 177,000 cubic meters, the work of art is the largest ever inflated envelope without a skeleton. STRP Biennial, a walk through the city of cyborgs - We Make Money Not Art has a nice round up of the 6th edition that filled Eindhoven with 10 days of science&tech-infused art and of electronic music. 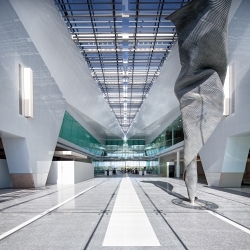 Canberra, Australia unveils its new $480m airport featuring sculptures by Andrew Rodgers. 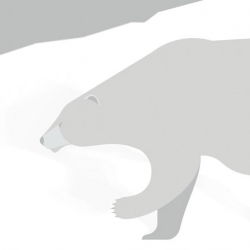 Alan Dalby's playful illustrated animals. 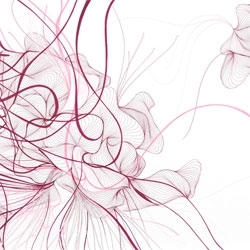 Swirling, amorphous curving drawings from Justine Ashbee. 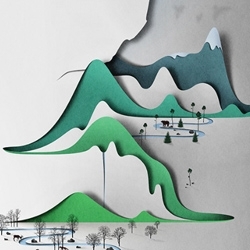 Vertical Landscape - Intricate and beautiful cut paper landscapes by Eiko Ojala. Text 3D-printed on a Makerbot Replicator 2, scanned, photographed, arrayed, and reprinted to create ornamental patterned wallpaper. 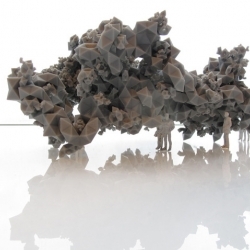 French artist Jérémy Laffon creates impressive structures & installations with sticks of chewing gum. 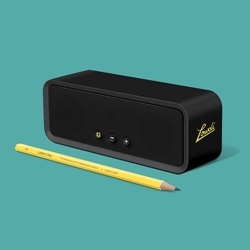 Lowdi is a uniquely designed portable wireless speaker that turns any phone, tablet or mobile device into a powerful sound system wherever you go. 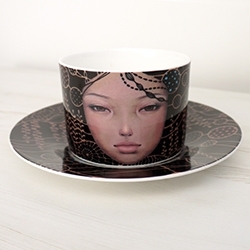 Beautiful new limited edition cup & saucer set from Audrey Kawasaki. 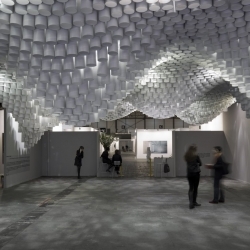 The Creators Project profiles the architects and designers Aranda\Lasch that build awe-inducing crystalline structures. 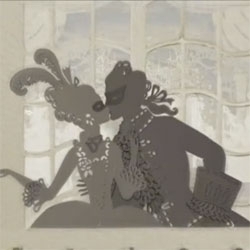 VIDEOA look at the making of ITV3's new papercut identity shorts. 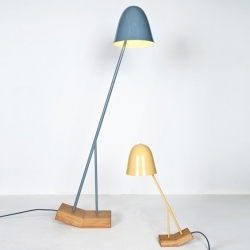 'Pilu' lamps by the German designer Leoni Werle. 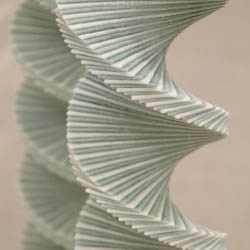 Paper chandeliers by Cristina Parreño. 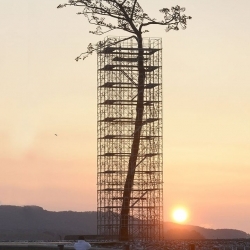 'Art of Plants' by Makoto Azuma. 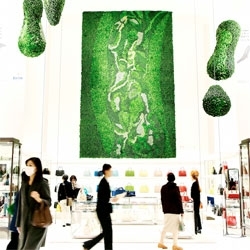 The beautiful leaf installation decorates the Isetan Department Store in Shinjuku. 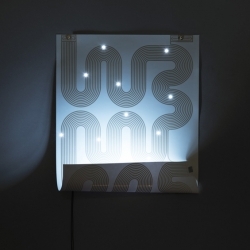 'L-Ink' poster-lamp by the French designer Jean-Sébastien Lagrange and Chevalvert, exposed at the Biennale Internationale Design Saint-Étienne 2013. 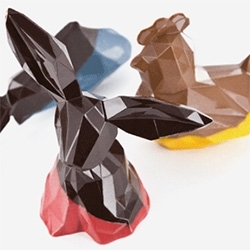 Kaleidoscope ~ Lovely geometric/faceted easter chocolates of La Grande Epicerie de Paris and chocolatier Daniel Mercier. 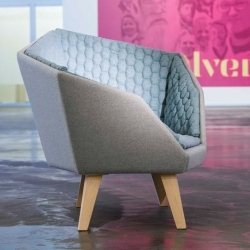 'Frigg' couch by Danish designer Marianne Kleis Jensen. 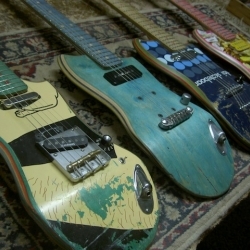 Some pictures and a video of guitars made of shreddered skateboards by Ezequiel Galasso. 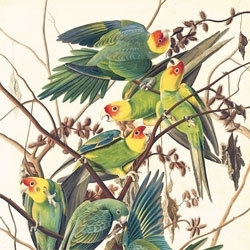 Audubon's Aviary: The Complete Flock, a stunning exhibition of Audubon's beautiful bird paintings at the New York Historical Society. 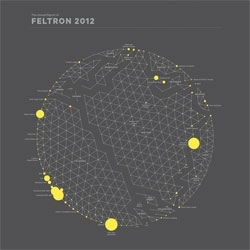 The beautifully designed Annual Report of Feltron 2012. 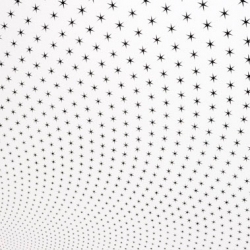 Richard Wright's stunning ceiling paintings of over 47,000 black stars for Amsterdam's Rijksmuseum. 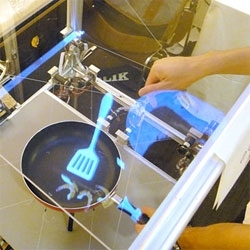 VIDEOPractice your culinary skills with the Tokyo Institute of Technology's 3D cooking simualtor. 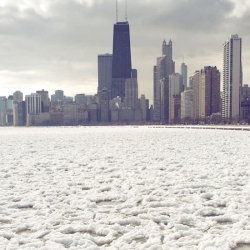 Dave Gorum captures the floating ice on Lake Michigan in these animated gifs. 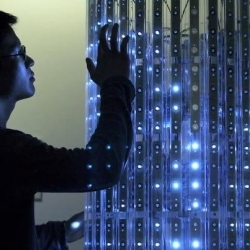 VIDEOJin-Yo Mok wants to create art without secrets. 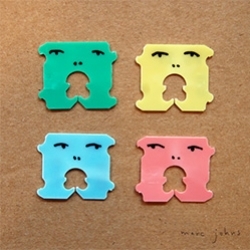 Scout Paré-Phillips captures the subtle impressions left by clothing on skin. 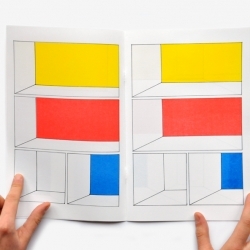 Amazing Comic Book by Frédérique Rusch. Charles Burns + Piet Mondrian in perspective. 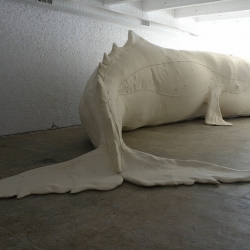 Wooow! 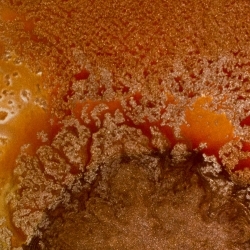 Artists Emmanuel Fritz and Collin Schipper use sound at extreme volumes to arrange paint into fractal like patterns. 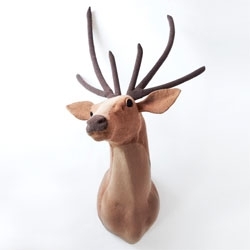 Jessica Dance creates these beautifully knitted taxidermy heads, The Knit Heads. 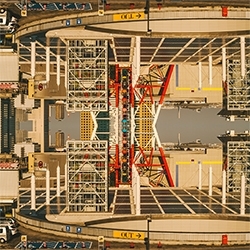 Stunning images deconstructing city scenes from Ben Thomas. 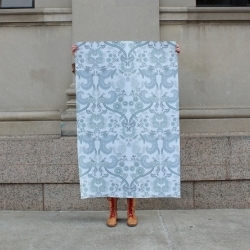 His new series, Accession. 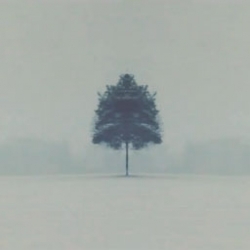 VIDEOSymmetrees, lovely footage of a snow storm by Oliver Latta. 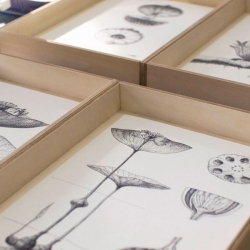 Keita Akiyama's beautiful drawings of fictitious plants. 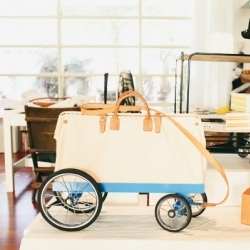 A studio visit with Laurel Broughton of Welcome Companions. 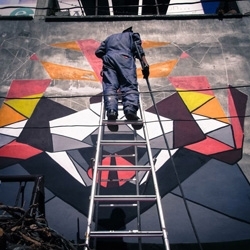 Red Panda mural by the artist DAAS, part of the Kolor Kathmandu project in Nepal, to bring awareness to its endangered species status. 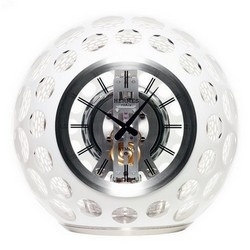 French fashion house Hermès joined forces with watch and clockmaker Jaeger-LeCoultre and Cristalleries de Saint-Louis to realise the Atmos Clock. 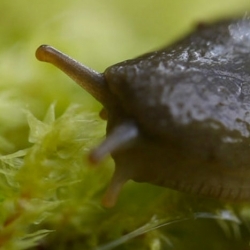 VIDEOMossgrove / Bed of Moss, lovely timelapse by Kurtis Hough capturing the moss and slugs of Oregon. New York-based painter and sculptor Joe Fig built some miniature dioramas of famous artists in their studios. 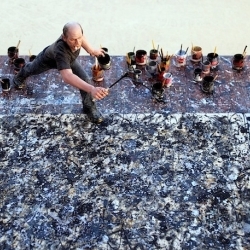 He has painstakingly sculpted the studios of everyone from Jackson Pollock to Ryan Mcginness. 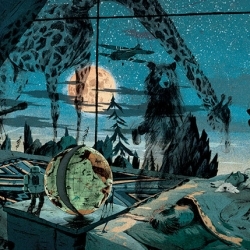 Gorgeous illustrations from Anton Van Hertbruggen. 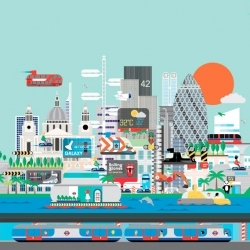 Making of Creative Review's March cover, inspired by 150 years of the London Underground and illustrated by Robert Samuel Hanson. 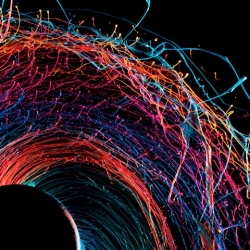 VIDEOMore lovely work from Fabian Oefner, this time capturing paint flung by centrifugal force in his Black Hole series. 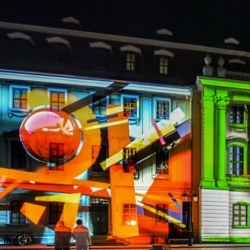 VIDEOUnder an Alias from nerdworking, site-specific projection mapping in Weimar. 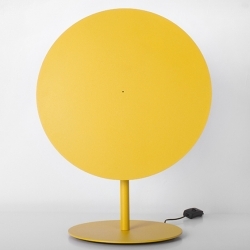 'OOO' lamp by the Ukrainian designer Vasily Butenko.